Griswold Controls’ Irrigation High Limit Constant Flow Valves limit the flowrate (gallons per minute) to your exact need. Today a maintenance person can change the flow on an irrigation zone by easily adjusting the valve with the handle, increasing or decreasing that particular zone. This is a problem because the system is designed for a certain flow rate and by adjusting the valve you now are changing the performance of that particular zone. Limiting the flowrate to design flow gives the designer and property manager the confidence that their system is performing to their criteria. 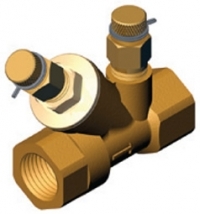 Corrosion resistant – brass housing in 1/2″-3″ valve and epoxy coated housing in 3″-20″ valves.